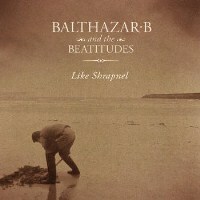 Balthazar B and the Beatitudes might seem like an odd name choice for a band but there’s definitely nothing odd about their sound. Creating a beautiful mix of indie folk and rock, Balthazar B and his ever-revolving cast is bent on sharing their gorgeous melodic sound to anybody who wants to listen. The group was founded and fronted by Paris based musician, Baltazar B. To complete his sound, he enlists the help of friends from various walks of life, some of them doctors others “geeks and religious scholars.” This helps create a fresh menagerie of sound that’s a certain delight to listen to. Like Shrapnel is a short EP that was recorded in pockets of time between Paris and London. Despite being short, with only a running time of no more than 18 minutes; the album easily conveys a soothing and captivating mood. Red Ribbon is a quiet single that features great harmonies while Madagascar, is a more upbeat cut that’s filled with harmonicas and guitars. The short compilation is then capped off by, Snowden’s Secret. It’s a blissful track that makes you think of quiet snowy mornings. Like Shrapnel was released back in April 25th, 2011 and features Alex Dowding on guitars/keys/vocals; Tom Kershaw on bass; Charlotte Domanski on violin; and Dan Bush on drums. Grab the download. This is one relaxing record that deserves a listen.